As the newly appointed medical physicist at the Sunshine Coast Hospital and Health Service (SCHHS), Daniel Sopher, could rightly be called one of the most highly specialised hospital-based scientists in Queensland! He is definitely the man whose expertise you’d want behind the machine in the radiation oncology team in the Adem Crosby Centre at the new Sunshine Coast University Hospital. 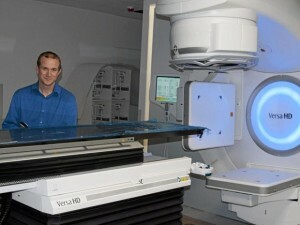 “I’m a medical physicist with the radiation oncology team for the new hospital; I work on cancer treatment machines called linear accelerators, which deliver life-saving radiotherapy to patients with cancer,” Daniel said. From the time he was in high school in Wollongong, Daniel knew he wanted to pursue a career in science and mathematics. “When I saw a course on medical physics I thought it sounded fascinating. However at the same time, I really like playing with great big machines!” Daniel said. Daniel joined the SCHHS this month, with a Bachelor of Medical Physics from the University of Wollongong, and a Master of Science in Medical Physics from McMaster University in Ontario, Canada. “I had moved to Canada to work in Ontario. My wife and I then decided to choose a place to raise our kids, and with the exciting opportunity of starting with a new team at the Sunshine Coast University Hospital, we chose the Sunshine Coast. “Every physicist wants to be a part of commissioning a new service. It’s so exciting being involved from the very beginning, helping to set the complex equipment up, and implementing systems to be put in place. “I’m contributing to something that is making a big difference to those suffering with cancer,” Daniel said. The Adem Crosby Centre is an integral component of the new $1.8 billion Sunshine Coast University Hospital (SCUH), due to open in April next year. It will deliver excellence in clinical care, research and education. The centre has two Elekta Versa HD linear accelerators, worth about $5.6 million in total and in this way, SCUH will provide the region’s first publicly-delivered radiation oncology service. Director of Oncology Dr Jeremy Long said this represented a real benefit to our Sunshine Coast community and the locals here needing radiation treatment. “I am so excited about the level of services the Adem Crosby Centre will offer our community,” Dr Long said. “It will make the health care journey easier for our patients and their families, offering a ‘one-stop shop’ facility which will provide medical oncology, radiation oncology, haematology and acute specialised inpatient services,” Dr Long said. “Any inpatients needing radiation oncology treatment will no longer have to be transported by ambulance to an external facility. Our radiation oncologists will be able to work in our facility for all aspects of their patient’s cancer care. “We have forecast that more than 650 patients will receive 13,000 treatments from the linear accelerators in the first year of operation. “That means that for the first time hundreds of people here on the Sunshine Coast will be able to get the treatment they need, close to their homes and families,” he said. • The linear accelerators are installed in specially designed ‘bunkers’ in Sunshine Coast University Hospital’s east building. • One of the first sections of the hospital to be built, the bunker’s construction commenced in early 2014. • About 2000 cubic metres of concrete and 180 tonnes of reinforcing steel were used to build the bunkers. The roof is 2.35m thick at its deepest point, while the thickest wall is 2.4m wide.